Dixie, Howard's first horse. She taught him to ride. 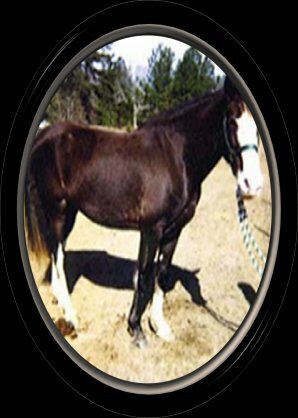 Though Dixie wasn't registered, she was definitely a Tennessee Walker and real smooth. She was an ultimate pleasure to trail ride. Dixie's spotted baby we sold was Legacy, our first stud colt on our farm. See Legacy in the Foals Sold section. We miss Dixie, but we just couldn't hold on to everyone. Like a First Love, I don't think you ever forget your first Horse, either. They prepare you for all the others that ebb and flow into your Life, but your memories, like a rolling tide, keep returning to that same shore of what you shared together. Dixie gave Howard the beginnings of a Horse Infatuation that has only blossomed over the years, and she gave him the confidence to ride off into all unfamiliar Sunsets. This Song is for you Dixie, and whoever shares those Sunsets with you now.